Well, I've been in a bit of a blogging funk lately, but what better to change that than a blog makeover! I thought it was time to make some things different so I stayed up last night working away. Oh and I have to give T major credit, he drew that Raleigh skyline for me...how awesome?! What do y'all think? I'm pretty happy with it. :) I promise I will be back soon with some DIY's I've been working on that y'all are gonna love! Oh, and I got a little crazy in photoshop last night and decided to make a march desktop calendar and share it with y'all..you're welcome :) Happy March!!! Love the new header! And what a pretty desktop! Happy weekend! New design is perfect!!! Way to go T!! Y'all both are so talented. Fellow Raleighite :) I love the new design and thanks for the desktop background! Its really pretty! Loving this!! Sucker for anything polka and pink:) Have a great weekend love!! Loving the new look of your blog and that desktop calendar is adorable. Love the new look! Can't believe he drew it..you both are so artsy! how adorb is this desktop calendar! thanks for sharing!! 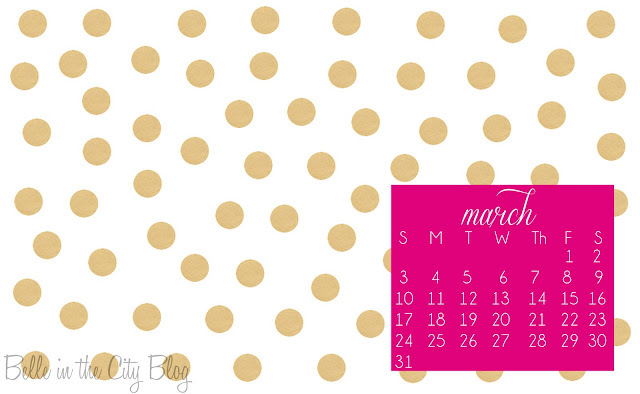 LOVE the calendar - and your new blog layout is amazing! Obsessed. Thank you for my desktop calendar, I love it! Such a cute new design! I like it! And i am loving that calendar. I'm obsessed with anything polka dot.